In a strange bit of irony, the dress that stole the spotlight at the 87th Annual Academy Awards this past weekend has, in turn, been stolen. As reported by TMZ, the dress worn by Lupito Nyong’o at the Oscars, which is worth $150,000, was jacked directly from the actress’ hotel room earlier this week. She was staying at The London West Hollywood, and has reportedly told cops that her outfit for the Oscars was taken from her room in between the hours of 8 a.m. and 9 a.m. on Wednesday while she was out. The latest update on the situation is that police are investigating security camera footage that could potentially catch the criminal in the act. 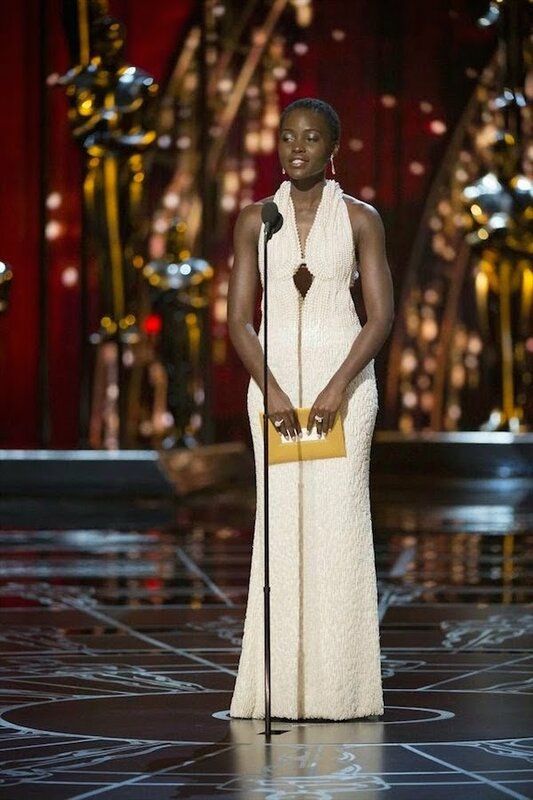 Lupita Nyong’o may not have been up for an honor at this year’s Academy Awards, but she certainly dressed like it. The 12 Years a Slave star/Best Supporting Actress winner wowed onlookers as she sashayed onto the red carpet in a custom-made Calvin Klein dress bedecked with various pearls. It was truly a sight to behold, but we might not see it again. But at least the thief has good taste. Since hitting the red carpet, this Calvin Klein creation has been the most talked about look from Hollywood’s big night. The piece sported more than 6,000 pearls in five different sizes. It was hand sewn by Francisco Costa, who created a front peekaboo cutout, a plunging V-neck and open back. As Costa told Vogue, he looked at variety of different pearls, including South Sea, iridescent and natural. But his team ultimate decided that natural pearls looked the most beautiful. Despite its appearance, Nyong’o told PEOPLE that "it’s actually quite comfortable." The Oscar winner was attending the evening’s festivities as an official presenter. She got up on stage during the ceremony to announce the winner for Best Supporting Actor, and ultimately handed the statuette over to Whiplash star J.K. Simmons. Nyong’o has proven herself to be a true fashionista, since we first saw her making the rounds to promote her performance in 2013’s 12 Years a Slave. During the 2014 Oscars, she hit the red carpet with a light blue Prada gown befitting of Cinderella. It actually looks like Kenneth Branagh’s version of the fairy tale dress - as worn by Downton Abbey star Lily James in next month’s feature. But this pearl dress has been all any fashion critic can talk about since the Oscars, and it’s a shame its gone missing. Hopefully the police will be able to catch the culprit and obtain this dress. Nyong’o was a stunner in this look, but it’s so intricately crafted that it belongs in a museum.